It’s no secret that Boulder is a hotbed for bluegrass music. The area has spawned popular bands like Leftover Salmon and Yonder Mountain String Band, who might not be considered bluegrass in the traditional sense but certainly share an appreciation and admiration for the genre that undoubtedly influenced them. In fact, it’s not an exaggeration to assume that without bands like Boulder’s very own Hot Rize, Salmon and Yonder might not exist today. 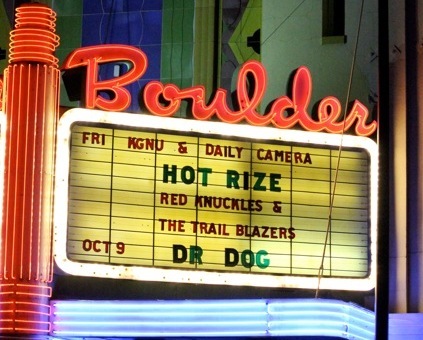 Hot Rize returned to the Boulder Theater on Friday for a night of old-fashioned fun. 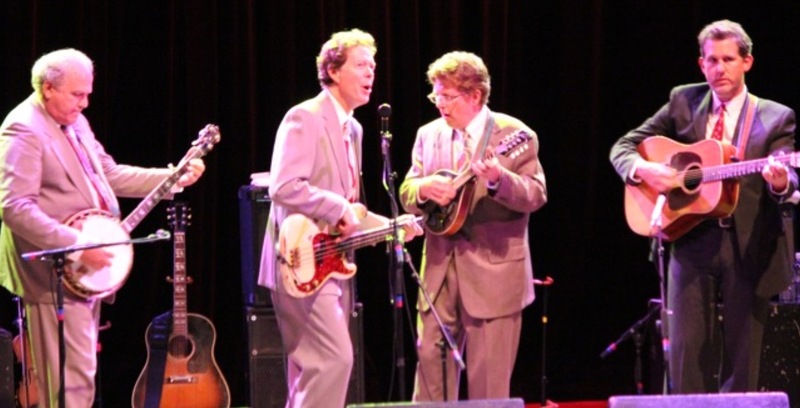 The legendary band practically bleeds bluegrass, with their suits and ties and unplugged instruments (except for Nick Forster’s barely plugged in bass), right down to the single microphone the group crowds around to harmonize. The crowd itself was a bit on the older side, which isn’t surprising considering the band has been in existence for almost 35 years. Hence, the show was seated, a first for me at the Boulder Theater. Things started off strong with “Ninety Nine Years (And One Dark Day)”, off their self-titled debut album, followed by “Hard Pressed,” an original song by mandolin player and lead vocalist Tim O’Brien. After a superb version of the traditional song “Keep Your Lamp Trimmed and Burning,” Forster took some time to introduce the band, keeping things light. Pete Wernick, aka Dr. Banjo, introduced Forster, who of course is already a regular at the Boulder Theater as host of the syndicated radio show eTown. The band played some more short but sweet tunes, including “Radio Boogie,” “Colleen Malone,” “High on a Mountain” (which featured Wernick using a phaser effect on his banjo), and the theme song to the old Martha White Biscuit and Cornbread Time show, initially popularized by Flatt and Scruggs. Hot Rize got their name from the leavening ingredient in Martha White’s flour. Forster then revealed how Wernick got the nickname Dr. Banjo: he earned a PhD from Columbia University, whereas the rest of the members in the band only had one year of college experience total among them. Finally, guitarist Bryan Sutton was granted a chance to shine on his song, “Hangman’s Reel.” The flat-picker extraordinaire dazzled the mostly subdued crowd, and actually inspired a few genuine hoots and hollers. His solos consistently drew the loudest applause throughout the night. For those who are unaware, Hot Rize often performs as their alter ego Red Knuckles and the Trailblazers, a honkytonk group from the small town of Wyoming, Montana. So, after “Hangman’s Reel,” Hot Rize switched out their unplugged bluegrass instruments for plugged-in electric ones and their dapper suits for some decidedly garish cowboy wear. Forster (aka Wendell Mercantile) was the most fashionable, with red tassles hanging from his suit and guitar. The group obviously has a lot of fun getting into character, and the crowd loved it as well, especially when they played their most popular song, “Oh Mona.” The banter was quite excellent, too. My favorite joke was Wernick, in his persona as the dim-witted Waldo Otto, saying, “Don’t call him an enigma. He’s an igma!” Cue the rim shot and muted trumpet! The guys then came back out as Hot Rize and performed the fan favorite “Nellie Kane.” A surprise treat followed, as Forster and Wernick debuted a new song recently written in Forster’s basement. Another brief set from Red Knuckles came next, with Forster swapping his red tassels for white ones and Waldo Otto’s brother Elmo Otto (fiddler Justin Hoffenberg) joining the band on stage. Overall, it was an excellent show. Even though it was over by 10:30 (presumably due to the semi-geriatric audience), they played an impressive number of songs, all of them featuring top-notch vocals and instrumentation. 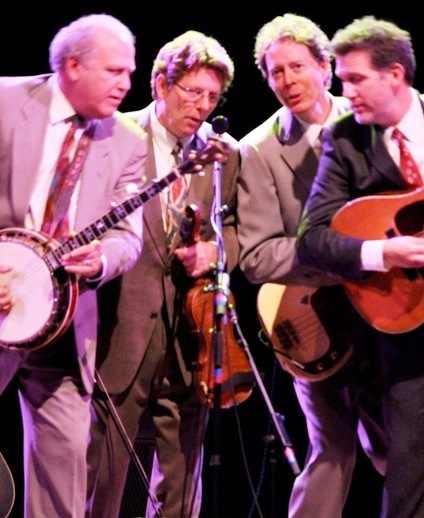 There is little doubt that Hot Rize is one of the most respected and accomplished bands around, bluegrass or otherwise. As long as they’re around, the bluegrass scene will remain alive and vibrant in Boulder.